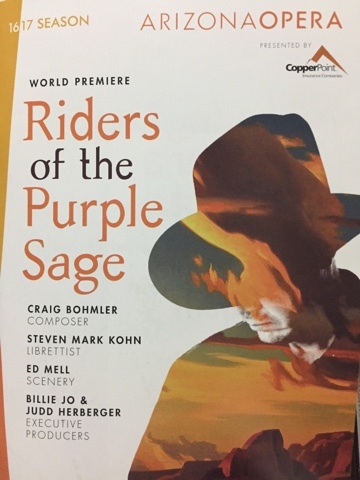 I don't know if any of us knew what to expect from Arizona Opera's first world premiere, Riders of the Purple Sage. But it is a safe statement to say that we all enjoyed what we found. Riders of the Purple Sage is in fact a Zane Grey novel; he's the author of all the Westerns that you see covering shelves and shelves of antique stores and other relevant locations. The idea, then, of using a Zane Grey story was to embrace the Southwest with this production, a production made in Arizona and taking place around Arizona (technically, it took place in Utah) and celebrating the cultural heritage of Arizonans. And all of you know that I love that aspect alone. Was I, though, somewhat hesitant about an opera being a Western? Yes, I was. The two operas that I've seen were classics sung in Italian; this is both a new piece and an opera in English. And yet composer Craig Bohmler and librettist Steven Mark Kohn made something that felt cohesive and natural. (Here I will remind you that I am not a musical person, nor do I know all the musical terms with which to talk about an opera. Which is fine because I'm sure other people have already offered their learned, musical analyses of this opera.) The performers are singing music that is written for these words, so it never felt odd for them to be singing these lines just because they're lines in a Western. And there is something very grand about Westerns that in fact lent itself to opera style, if that's what I can call it. There were two standout moments for me, musically. The first was Jane's (Karin Wolverton) song in Act 2, in which she speaks about God's love and thinks about her father. Karin has a wonderful voice, kind and feminine and strong and powerful. The second moment was the duet between Bern Venters (Joshua Dennis) and Bess (Amanda Opuszynski) in the same act; it's basically a falling in love and seeing that all is right in the world through that love type of song. Their duo and their place in the story reminded me a bit of Cosette and Marius in Les Miserables. Now I come to one of my favorite aspects to talk about, the stage. At the end of the production, when everyone was clapping for the performers, they started to bring out the crew, as well--and when scenic designer Ed Mell came on, everyone started cheering. Many Arizonans probably know Ed Mell's name, and even most of those who don't would at least recognize the style of his work. He does paintings the Southwest that, through simplicity of shape and exact use of color, really capture the feel of the land. So in this opera, there were the sort of traditional cutouts (in this case, of orange cliffs) that were sometimes on the edges of the stage. But there was also a huge screen that covered the entire back of the stage; because his paintings were on that screen, it was like having a painted backdrop there. My eye couldn't tell that it was a screen. And sometimes there were mountains with clouds above them, and the colors of the mountains would change as with the changing light of evening and the clouds above would shift as in a real sky. Painted clouds shifting while the mountains stay still. It was a flawless use of technology and truly beautiful. It was like being inside an Ed Mell painting, and as I said, his paintings capture the feel of the land--therefore as you were watching the stage, you felt as though you were watching the land. Oh, and there was lightning, too, stunningly real lightning. I don't think I'll ever see a stage like this one was again. I'll finish with a couple of notes on story and theme. Jane is the main character of this piece because she is the one reacting, she is the one trying to choose the path, and she is the one that holds it all together. She's a Mormon woman whose father left her his ranch. Tull wants her to marry him, and the townspeople want her to marry him so that he can have her ranch. But she doesn't believe that she's supposed to marry him. There is also conflict because one of her workers, Venters, is not Mormon; the others resent the fact that Jane is kind to him. And of course along comes Lassiter seeking vengeance against someone in the town (he doesn't yet know who); Jane has to try and reconcile her liking of Lassiter with her need to protect her people. So there is a wonderful theme in there of Jane's faith, which remains steadfast even when other people try and pressure her to do things contrary to what she believes. Any person of any religion can relate to that situation, and that pressure can come from both inside and outside the faith--it just goes to show that people are always people and people always find things to disagree about and we just have to hold true. And there were a couple of pretty lines in there about knowing that God is there because of this beautiful land, something like that; I enjoyed those. And going back to the themes, there were messages about treating everyone with kindness. Jane, who is very devout in her Mormon faith, is kind to both Venters and Lassiter even though they're outside of her faith and the rest of the town sees that as reason enough to keep them away. And because of that hatred (promoted mainly by Tull and the Bishop), the town that's supposed to be upholding a positive faith is trying to use it not just against Venters and Lassiter but also against their own, against Jane. So there is a relevant message in there about how destructive we can be when we forget how to relate to other people with kindness. So all around, going through all of the aspects that make up an opera, this was a quality, memorable, and significant production. I didn't know what to expect, and therefore I walked away mesmerized by all of the artistry of this opera to represent the Southwest. It was a big endeavor, so it was a pleasure to be able to watch it and to see that all of that work came together so successfully.